Maybe it is the elementary teacher in me. Maybe it is that I am finally catching on to the letter trend. 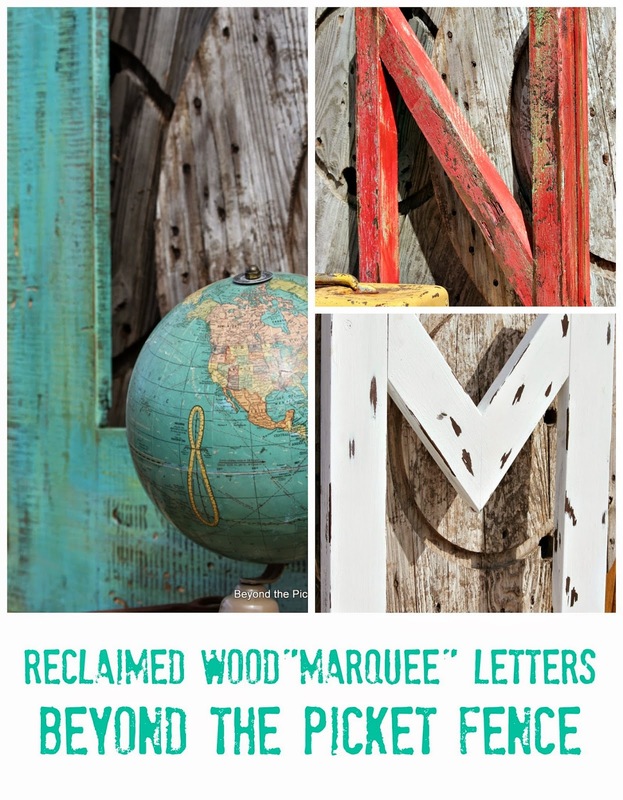 Maybe it is my need to use up bits and pieces of wood, but after making the YUM, (SHOWN HERE) I am totally groovin' on making letters from reclaimed wood. And yes, I said groovin', after all I was a kid in the seventies when groovin' was groovy. This week I made an L, M, N.
Why those letters? Because they are easy to make (general directions HERE) and are common letters for last names. The L is made from reclaimed oak and is about 2 1/2 feet tall. I painted it in blues in greens because if it doesn't sell, it may be mine :). The M is smaller and I kept it white and chippy because I knew the original dark wood stain on the trim I used would look great peeking out from white paint. The N is in red and is from a chunkier wood. I may eventually work through, build the whole alphabet, but for now I am happy with my middle letters--L, M, and N.
What a great idea, as usual! I love this and I'm thinking of where we could do it now. Thanks for the idea! Oh and I totally rocked at four square too...ah, the memories! Love these and the chippy paint colors too! Looks great! I love the aged wood.